When the whole of West Bengal is busy with the polls, mainly North Bengal preparing for the 18th, a riot of colours in white background are sweeping the higher regions of Darjeeling Hills and Sikkim. As experts have commented, this year the Rhododendron flowering is a month earlier because of change in micro-climate, but we still see the snows kissing the mountains time and again at this time of the year. 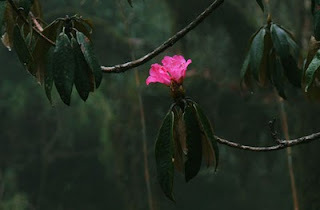 I jokingly said, ‘you know Sikkim is celebrating the Rhododendron Festival closing ceremony, and you need them flowering’. A team that went on to find the trails of the Red Breasted Hill Partridge, a species which is in abundance in the Singalila Ridge dividing Nepal with India in the East Himalaya said that they were astonished to see all the celebrity species of the Pheasants in the fog filled Ridge. The last 10 years of reporting by nature lovers show that the general awareness about nature conservation among the people living in the Darjeeling Hills and Sikkim has increased and it is believed that ‘community based tourism’ has played the positive dynamics. 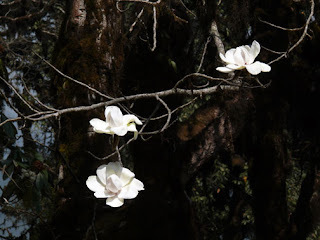 The exams in schools throughout the country are almost over and it was time for the domestic tourists to flood the area to enjoy the snows and all kinds of flowers (Red, White and Pink Rhododendrons, Primulas and many other wild Himalayan flowers). Every year I remember the tour leaders from Help Tourism lead ‘flower fanatics’ from UK, Netherlands, New Zealand, Japan, Singapore and Australia. Singalila National Park, Neora Valley National Park, Barshey Rhododendron Sanctuary, Khangchendzonga National Park and Singba Rhododendron Sanctuary are some of the places which house the Himalayan Flower Hubs. Rhododendron is revered as one of the oldest flowering trees and the popular belief is that the Dove from Noah’s Ark had returned with a Rhododendron sprig. 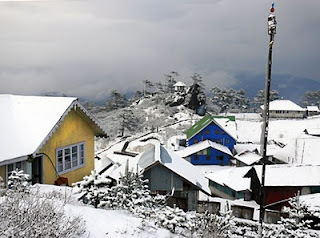 I know of the Help Tourism research team which keeps track of all the flowering areas of East Himalaya, specially the hidden secrets of Bhutan and Arunachal Pradesh. 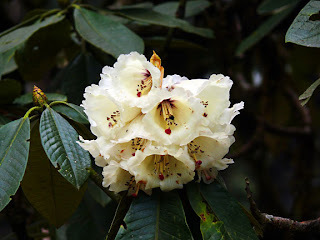 I have seen 08 inches flowering plants to big flowering trees of Rhododendrons all flowering between March to June. The later flowering towards June is mainly in higher altitudes on the shrubs and is complimented with monsoons and leeches. Rhododendrons always remind me of my days in Pelling and West Sikkim in the early nineties. The Sikkim Tourist Centre had just started and I spent months with Sanjib to set up the first community based tourism infrastructure for West Sikkim of which I hardly had any idea, but I travelled widely throughout the district to motivate people. This is when my mother often visited me to help training in the kitchen for food production in the Roof-Top Khangchendzonga restaurant. She had gone on a trek to Barshey and that was the first time I heard of the blue/purple rhododendron that she had seen.